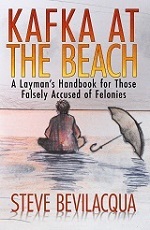 A Layman's Handbook for Those Falsely Accused of Felonies. The hilarious and shocking story of a most devastating ordeal. DON'T GO AWAY MAD, JUST GO AWAY: FACEBOOK'S ZERO EFFECT ON MY PRESIDENTIAL ELECTION. Please check it out. Thanks!!! I'm guest blogging on my friend's site today. It's a piece about 5 Films I Saw for the First Time in 2014. Please check it out - it's fun! I'm having a BOOK SIGNING at the VENICE BEACH MUSIC FEST! This Saturday, August 23rd from 12-3, on Windward Plaza in Venice Beach, 90291. There’s a free concert all day, lots of local artists will be showing their work, and I’ll be signing copies of my book, KAFKA AT THE BEACH: A Layman’s Handbook for Those Falsely Accused of Felonies. This is the best kind of book signing – right on the beach with a free concert going on across the plaza. The organizers invited me to their last festival in May and it was a blast! When they asked me back for this one, I jumped at the chance. This is a very fun event. Swing by if you’re near Venice! The Mystery of the Publication Date Partially Explained! When you use CreateSpace to publish the trade paperback of your book, you need to approach your “publication date” with care. My publication date ended up being inaccurate because I was learning things the hard way. The CreateSpace publication date for my book is off by months. Once a publication date is entered for your book, it cannot be altered. I have no idea why. There might actually be a good reason for this, but don’t ask the Createspace employees to explain it because they’re probably not going to know. However, the first time you upload the original, uncorrected, manuscript of your book to CreateSpace, that is the date CreateSpace will carve in stone and never allow you to change. My publication date says April 5th when in reality, my book wasn’t actually published and available for sale until months later. That original date was simply when I began figuring out the CreateSpace process. After that came a lot of adjustments…the text, the font, the cover, the trim…with many periods of waiting in between. I downloaded multiple versions of my digital proofs, and then a ordered few versions of my physical proofs, trying to get everything right. But once a date is entered, you cannot change it. It is part of your proverbial “permanent record.” So if you’re planning on fixing up your book to get things right, you might want to pick a date in the future that will more accurately reflect the time spent preparing your book for publication. I don’t know how much this matters. Some online sources say that this could be a problem because it makes your book look older than it is, so people will consider it less “new” and be less interested in reading it. However, I’ve decided that I don’t care. But if you’re concerned about accurate timing, be careful what date you enter the first time you create a file for your book on CreateSpace. Overall, I’m happy with how things went for my paperback with CreateSpace. To be honest, this is mostly because I did much as I possibly could myself, without relying on the CreateSpace folks. I definitely recommend taking the bull by the horns with CreateSpace. Because when you do need their advice, guidance or expertise, it doesn’t always go smoothly. Once you engage the CreateSpace “team”, you discover that they don’t work so well together. Each individual, and each department, seems to know nothing about what the others do and this can cause problems. The “layout” people don’t deal with the “proofs” people, who don’t know anything about the “cover” people. In general, I’ve found the CreateSpace employees to be helpful until you mention a different department, at which point they become like Dr. Seuss’s aloof, snotty Star-Bellied and Plain-Bellied Sneetches. In my experience, most of the CreateSpace employees don’t even know what’s written on their own site. They try to present this ignorance as some form of professional pride regarding their specialized area of expertise, which by the 6th phone call starts seeming incredibly sad. You wonder how much of their lives these folks spend in their cubicles, willfully ignorant of things that are not that complicated, convincing themselves that their ignorance somehow makes them more valuable. Despite the minor annoyances, at the end of the day, CreateSpace provides the tools with which a motivated, self-reliant author can get their book on the market in paperback form for a very low cost. It’s a wonderful thing – an immensely valuable tool in getting published the hard way – and for that I applaud them. I always assumed that releasing the ebook version of my book would be easier than getting the paperback to market. I definitely believed that when I set out on this process, and as uninformed assumptions go, it still makes sense in a lot of ways. But this assumption could not have been more wrong. The ebook portion of this journey is where things get frustrating and difficult, at least for me. Hey everyone! Here's a new column I wrote for the Huffington Post to get out the word for my book. Please check it out! Thanks! BOOK SIGNING AT THE VENICE SPRING FLING!!! Saturday, May 31st, from 1:00 – 4:00pm, I’m having a BOOK SIGNING at the VENICE SPRING FLING! A free concert and arts festival in Venice Beach, the Venice Spring Fling is a blast! It’s Windward Plaza in Venice Beach, CA. I know nothing about publishing. Zip. To me, it is an impenetrable sphere. I have no contacts and no experience in the book world. But I have a story to tell and I'm going to get published. I jumped into this journey completely clueless, and it's grown into an astonishingly complex labyrinth. I've learned everything the hard way, and I'm still not finished. But this is what I have discovered so far, and maybe it can help you in your quest to get published. How many book agents will you need to contact before you find the right one for your book? I don't know...maybe 58. I guess we'll see. I've made some great friends on this trip, and I've dealt with some colossal tools. And I'm getting closer every day. My name is Steve Bevilacqua and I’m going to get my book published. Starting with nothing, I’m going to scratch and claw my way into the world of publishing. Learn from my adventures as I kick down doors and struggle up the book ladder. Each step brings me closer to getting my book published. Maybe this blog can help you on your quest to get published. It will probably save you some time - by avoiding the many mistakes that I’ve already had the pleasure of making - and helping you jump right to the parts that were useful.